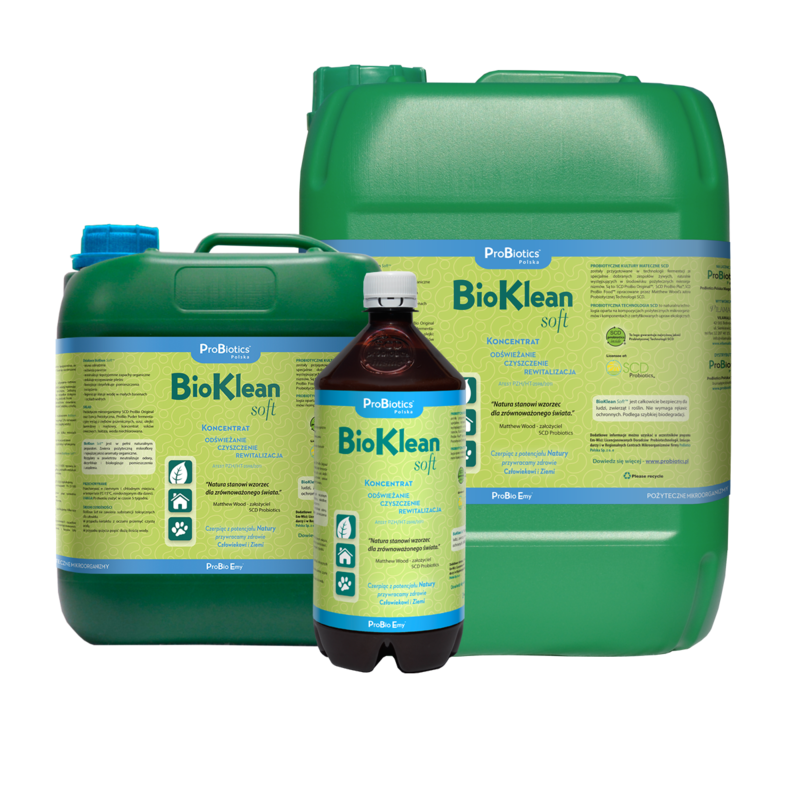 - BioKlean soft® hygienizes and clarifies water in small pools and ponds. BioKlean soft® is a completely natural product that contains beneficial microflora and the highest quality organic aromas. When sprayed, BioKlean soft® neutralizes odors, disinfects and biologizes premises and equipment. BioKlean soft® is completely safe for people, animals and plants. It does not require using protective gloves. It biodegrades easily. BioKlean soft® may be applied directly, but it is even more effective when used in dilution with unchlorinated water. In closed rooms, use a 10% solution of BioKlean Soft™ (1 part BioKlean Soft™ with 9 parts of water) to perform misting using a hand sprayer. Fill the room with a fine mist to coat all surfaces: carpets, bedding, curtains and upholstery. After misting, wipe the wooden, stone and plastic surfaces with a soft cloth. First, spray the floor with a 10% solution of BioKlean Soft™ and after waiting a few minutes, wash the floor with a 2% solution of BioKlean Soft™ (e.g. 100 ml BioKlean Soft™ in 5 liters of warm water). Spray with a 10% solution of BioKlean Soft™ and clean the surface after a few minutes. On more difficult stains, use concentrated BioKlean Soft™, leave it on for the night, and on the next day clean and rinse it. Moisten the surface with a 50% solution of BioKlean Soft™ and then clean it with a cloth. When added to fabric softener (1% solution, i.e. 1:100), BioKlean Soft™ gives the fabric a pleasant feel and reduces the residues of chemical detergents. To wash your car, use a 5% solution (1:20) of BioKlean Soft™ and then rinse it. Afterwards, spray with a 1% solution (1:100) of BioKlean Soft™ and leave it to dry. BioKlean Soft™ has anti-corrosive properties and slows down the aging / oxidation of materials such as plastics, leather and wood. Apply 1 lietr of BioKlean Soft™ per 1 m3 several times per season. In order to minimize unpleasant odors associated with pets, it is recommended to spray the areas intended for them (dog beds, terraria, cages and pens) with a 10% solution of BioKlean Soft™. 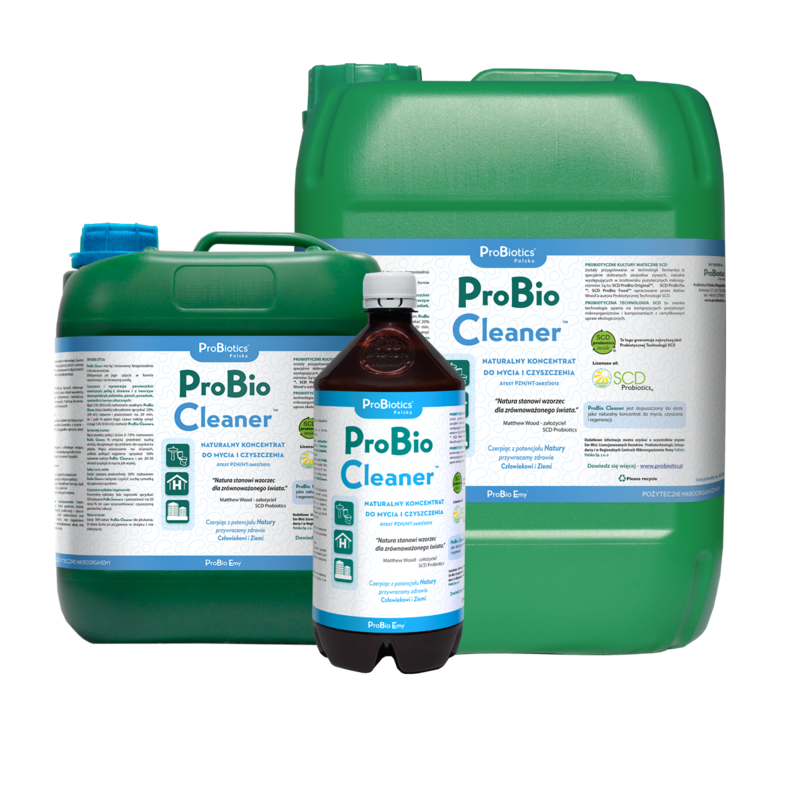 INGREDIENTS: SCD ProBio Original® probiotic microorganisms, Essential Probiotics™, ProBio Powder, fermented extract of wheat bran, dried herbal blend, lavender and peppermint essential oils, fruit juice concentrate, fructose, purified and structured, unchlorinated water.